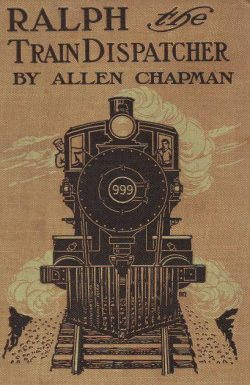 The Stratemeyer Syndicate ten volume railroading adventure Railroad series (aka Ralph of the Railroad) was initially published by Mershon, then Chatterton-Peck and finally Grosset & Dunlap. 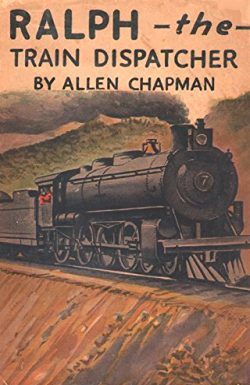 In this series Ralph Fairbanks works his way up the ladder to success on the Great Northern Railway and battles Gasper Farrington, one of the wealthiest men of Stanley Junction, and dissapated bully Ike Slump. His rapid rise can no doubt be accounted for by his penchant for stopping runaway trains, rescuing kidnapped relatives of the railroad president, foiling train robbers, and just generally being at the right place at the right time. A continuing theme throughout the series is Ralph's struggle to reclaim his late father's fortune, misappropriated by the greedy Farrington. 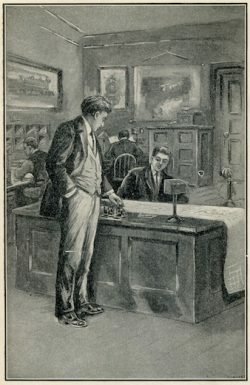 Most of the stories are in the public domain and some are available for free on Project Gutenberg and in free or low priced reprint editions available from Amazon.com. 4 in 1 omnibus containing the first 4 stories. Brown cloth binding, illustrated cover. Same for all editions. Dust Jacket: Light brown uncoated paper, same illustration as book. Rust color binding else as 1. Dust Jacket: White coated paper. Same for all editions. Brown binding else as 1. Illustrations: Frontispiece only on coated paper. Internals omitted. Dust Jacket: Same as 3.